The EL1809 and EL1819 digital input terminals acquire the binary control signals from the process level and transmit them, in an electrically isolated form, to the higher-level automation device. 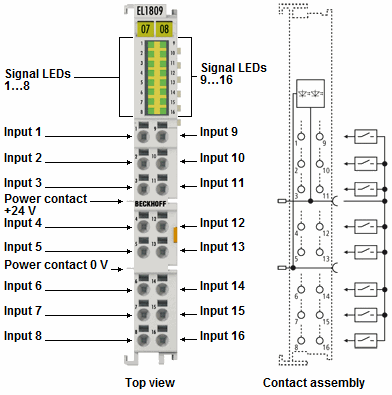 The EtherCAT Terminals each contain 16 channels, whose signal states are displayed by LEDs. The terminals are particularly suitable for space-saving use in control cabinets. By using the single-conductor connection technique, a multi-channel sensor can be connected in the smallest space with a minimum amount of wiring. The power contacts are looped through. For the EL1809 and EL1819 EtherCAT Terminals, the reference ground for all inputs is the 0 V power contact. The versions have input filters with different speeds. The conductors can be connected without tools in the case of solid wires using a direct plug-in technique.